STEP ONE: Prepare the pig’s feet by burning off any visible hair. To do this, hold one at a time over a gas flame on the stovetop or use a kitchen torch, then rinse with cold water until thoroughly clean. Sterilize one 2-quart glass jar with a lid, or two 1-quart canning jars. STEP TWO: Using a cleaver, split the pig’s feet in half lengthwise. STEP THREE: Put the split pig’s feet in a large pot and cover with water. STEP FOUR: Bring the water to a boil, lower the heat to low, and simmer, stirring occasionally, for 1.5 to 2 hours, until the pig’s feet are tender. While the pig’s feet are cooking, skim off any foam from the surface. STEP FIVE: Remove the feet from the cooking liquid, rinse with water, and set them aside. Discard the cooking liquid and clean the pot thoroughly. STEP SIX: Combine the vinegar, chiles, onion, ginger, remaining spices, the bay leaves and salt in the clean pot and bring to a boil. Lower the heat to low and simmer for 10 minutes. 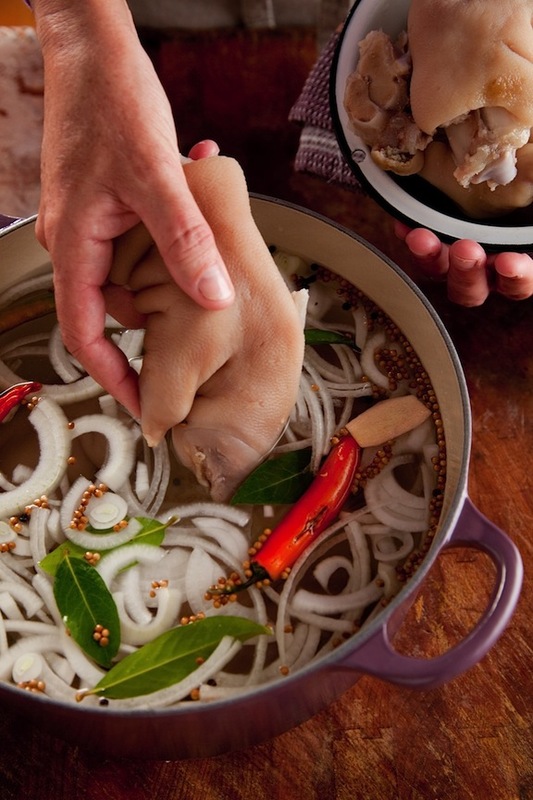 STEP SEVEN: Add the cooked, cooled pig’s feet to the vinegar mixture and bring to a boil. Remove from the heat and let cool slightly. STEP EIGHT: Transfer the pig’s feet to the sterilized jar(s), layering them with the chiles, onions and spices. Pour in enough pickling liquid to cover. Cover with a lid and refrigerate. 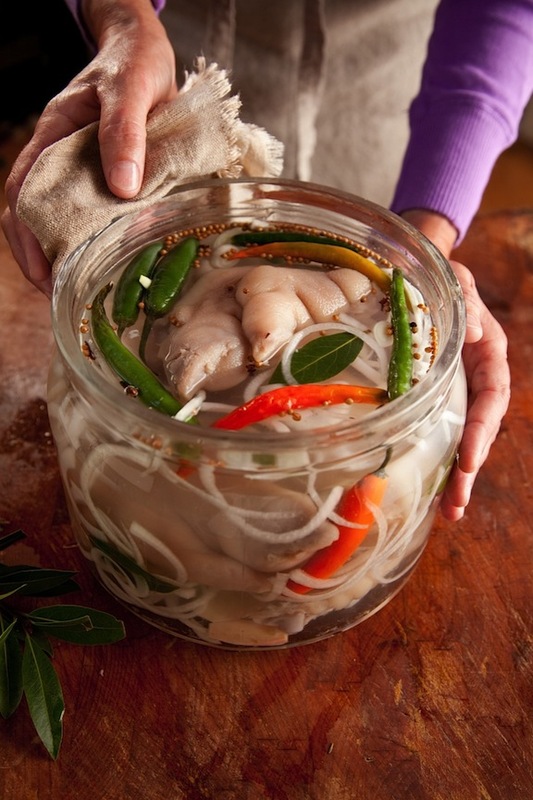 Partake of Hot Peppered Pickled Pig’s Feet (now really try and say that!) within 7 days after preparation. ***A pig’s foot a day could keep the wrinkles away…say practitioners of superfood eating. You see, pig’s feet contain high amounts of the protein collagen. Collagen works hand in hand with keratin to provide the skin with strength and resilience and is often referred to as the glue that holds the body together. Armed with this knowledge, I’m counting on my love of pig’s feet to help forty be the new thirty.